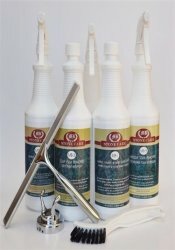 These natural stone care products will clean and beautify your marble, granite, and other stone surfaces. 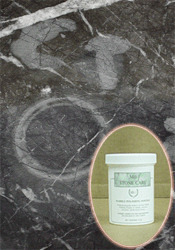 Not just designed to work exclusively with stone - they're versatile and can be used in many areas of your home. The information below has been gathered to help you make informative decisions. 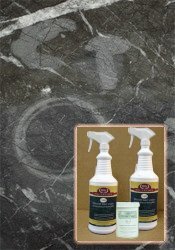 Read on to determine the other surfaces in your home that will benefit from these stone care products. 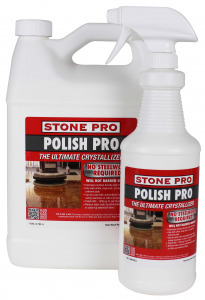 *Safe on most delicate polished stone surfaces. Read back label for extra precaution. 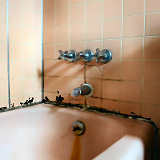 **Safe on ALL hard non porous or sealed surfaces. Read back label for all precautionary directions. 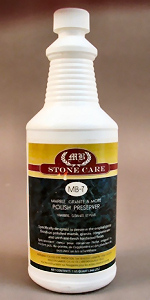 **It will not be effective at actually polishing granite, but it will remove "water spots" and other "ghost rings" from many polished dark granites. 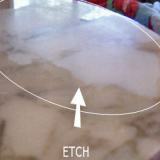 In the case of doctored black granite, it will remove the false black (doctoring waxes) applied by the factory. 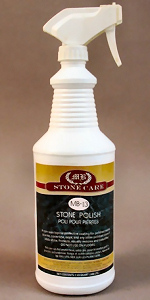 *Mainly used for unpolished stone surfaces. 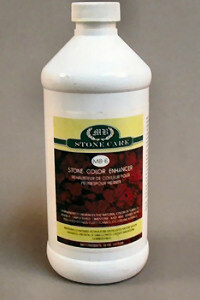 An enhancer will enhance polished surfaces provided they become darker when wet. This color enhancer will give you a permanent "wet look".